Activists gathered at the Town Clock Tower on Jan. 16 to protest a proposed expansion of Santa Cruz County’s Rountree Detention Facility in Watsonville. Holding signs with slogans such as “Save the Whales, Not the Jails” and “Education — Not Incarceration,” the protesters shared their experiences with incarceration over a megaphone, discussed alternatives and called on residents to oppose the expansion. 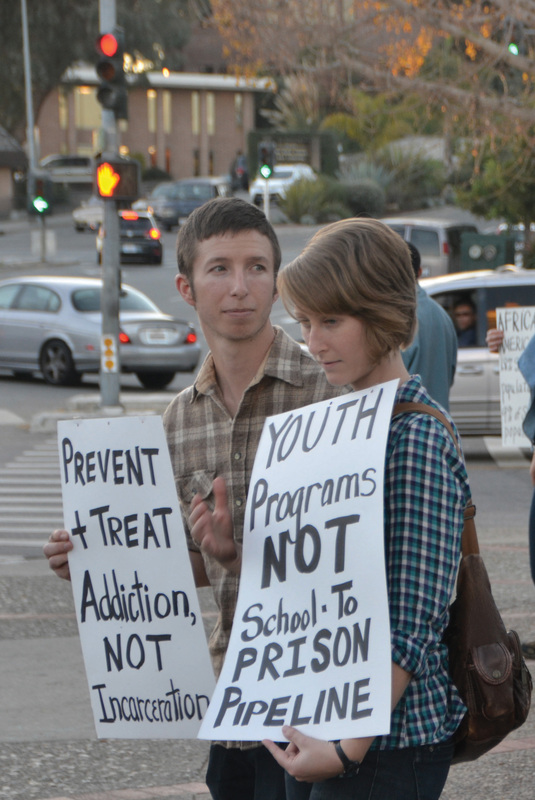 The protest was supported by Sin Barras, a local grassroots prison-reform organization. That same day, the Board of State and Community Corrections (BSCC) officially recommended that Santa Cruz County receive a $24.8 million grant for the proposed expansion. The Board of Supervisors has 90 days to accept or decline the grant. The expansion entails a brick-and-mortar addition to the overcrowded Rountree facility that would add 64 new beds, freeing up space for education and rehabilitation programs that are currently filled with temporary beds, said Sheriff Department public information officer Deputy Ryan Kennedy. The grant has been a source of pride for the Santa Cruz Sheriff’s Department, which applied for it last fall. Deputy Kennedy said the expansion would curb overcrowding in county jails and reduce recidivism by expanding programs that “set inmates up for success” after they’ve served their sentence. The protesters, on the other hand, are concerned the expansion foreshadows a permanent increase in the jail’s population and represents a misuse of money they’d rather see spent elsewhere. Activists displaying their support for education and rehabilitation rather than jail expansion made additional signs for protestors in solidarity with the cause. Photo by Matthew Tsuda. The money comes from a $500 million pool created by California Senate Bill 1022 in 2012 for county jail expansions. SB 1022 was passed in order to help offset the influx of new inmates into county jails caused by Gov. Jerry Brown’s 2011 AB 109 realignment legislation, which mandates that all non-violent, non-serious and non-sexual offenders will serve their sentences in county jails instead of state prisons. Last year, representatives from 36 counties submitted grant applications to the BSCC and 15 of those were conditionally approved on Jan. 16. Similar protests to the one at the Town Clock Tower occurred simultaneously in some of those counties, Hanson said. The applications were judged in part by how closely they meet AB 109’s goals of reducing recidivism by placing a greater emphasis on community-oriented rehabilitation and re-entry programs. Santa Cruz ranked first among medium-size county applicants and previously received awards for its innovative response to AB 109 with initiatives like the Custody Alternatives Program (CAP). The CAP allows inmates convicted of less serious crimes to do unpaid work at county sites or be confined to their homes and tracked with ankle bracelets in lieu of serving out their sentences in jail. Still, Tash Nguyen, a long-time member of Sin Barras, said the county should further explore ways to decrease its jail population instead of expanding its capacity. She listed bail reform, sentencing reform and expansion of the CAP as possibilities. Nguyen and other protesters said they were skeptical the expansion would contribute to a more humane and forward-thinking county jail system. Deputy Kennedy said while the Sheriff’s Department is committed to exploring all of its options, overcrowded county jails are a problem that can’t be fixed solely with additional programs. He said the new beds would reduce tensions caused by overcrowding and the more that are empty, the better. The ultimate goal, Deputy Kennedy said, is to create a “tiered” incarceration system allowing well-behaved inmates access to a wide variety of rehabilitation and re-entry programs while keeping dangerous offenders in more secure quarters. The Board of Supervisors is expected to make its decision on the grant by April, and both the Sheriff’s Department and Sin Barras said they will appear before the Board to argue their cases.